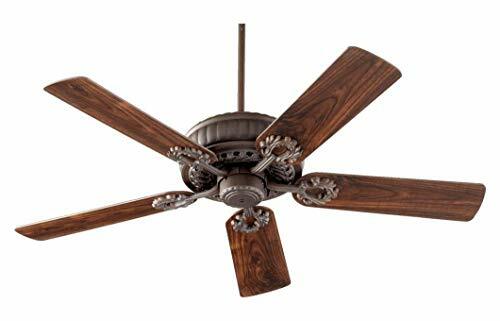 Add a ceiling fan to your room and get comfortable. 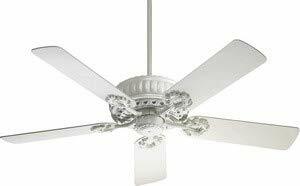 A good fan offers cool relief, circulates warm air for more efficient heating and adds a touch of fresh air to any space. 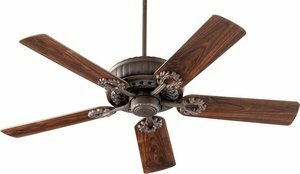 Our fan collection is wonderfully diverse, so there's a style to suit any interior. Durable construction guarantees whisper-soft operation and our wide variety of styles offer a decorative and functional addition to any room. 10 Finishes Available 52" Blade Sweep 80" of Lead Wire 3 Speeds-Reversible 16 Poles .62/.43/.22 AMPS on H/M/L 74/33/9 WATTS on H/M/L 157/101/49 RPMS on H/M/L Triple Capacitor Remote Control Adaptable Detachable Switch Cup Skirted Blade Arms. Rod Length(s): 4.00. Quorum International has an exceptional line of quality products aimed to please even the most discerning of consumers. Relish in the design of this 0 light fan; from the details in the, to the double coated Oiled Bronze finish, this fan is not only durable, but a tastefully elegant showpiece.